I'm currently planning to test, if the URSA Broadcast can compete with a Grass Valley LDX system (probably LDX86) in the key features hardware quality, picture quality, usability and picture adaptabilty. I just want to know if the URSA Broadcast can be an alternative to existing multicam broadcast systems and in case of an mixed setup (LDX as wireless system for example) the cameras can be completely matched to each other. I know, that there are a lot of differences (1 CMOS vs 3 CMOS / native UHD sensor vs HD sensor and so on), but thinking in 1080i50 (what unfortunately still is standard in most broadcast / event productions here in Germany) the systems should be comparable. Since the URSA Broadcast doesn't have an adaptive matrix like all other broadcast cameras are working with but the possibility of importing LUTs my question is: has anyone ever tryed with the URSA Broadcast to recreate the picture (dynamic: white / gamma / black / flare / knee and so on and color: matrix / color corrector / LUT) of another broadcast system? and if so any tips for me (espacially in working with LUTs? Haven't tried it.. have tried a quick test next to an LDK8000/60.. Which isn't a sensitive camera.. but the Ursa Broadcast was even less senstitive.. The LDX86 has much greater sensitivity than the LDK8000, so I imagine the Ursa Broadcast is a lot LESS sensitive than the LDX86 Unless we are talking about the LDX86N, that might be more evenly matched. Haven't looked at the colour space yet, but knowing how versatile the LDX is, it would be perfectly doable to match the LDX to the Ursa Broadcast atleast in terms of colour and gamma. You are absolutely right. I already had a look at the sensitivity and the difference was more than one complete F-Stop. So really a lot. Of course, more pixels = less sensitivity but the LDX86N (native 4K sensor) still is way more sensitive. Sander Vreuls wrote: Haven't looked at the colour space yet, but knowing how versatile the LDX is, it would be perfectly doable to match the LDX to the Ursa Broadcast atleast in terms of colour and gamma. I agree with you about the versatility of the LDX System. My formulation is a little bit imprecise. The thinking is more that you have the picture of an LDX System given and assume that the LDX is a System that is absolutely broadcast confirmed and set that as a "quality standard". Then I want to have a look, if the URSA Broadcast can reach to that. So the task should be to adapt the URSA Broadcast to the LDX in dynamic and color reproduction. I am thinking about matching the cameras on a 11 step greyscale (Image Engineering TE165) to bring white, gamma, black and flare to the same levels and then in a second step capture stills from a matrix testchart (Image Engineering TE233) and then create a LUT that imitates the color reproduction of the LDX under the given lightning. I think the 1-stop,difference you are seeing is the result of light loss from the Ursa Broadcast’s B4 Mount, which acts like a 1.5 teleconverter to expand the image circle to cover the larger sensor. So the actual sensor size is 13.056mm x 7.344mm and overall resolution is 4K? So the sensor is not cropped when using the B4 Mount, but in the B4 Mount there is a lense expanding the image from 2/3" size to sensor size? maxangsten wrote: You are absolutely right. I already had a look at the sensitivity and the difference was more than one complete F-Stop. So really a lot. 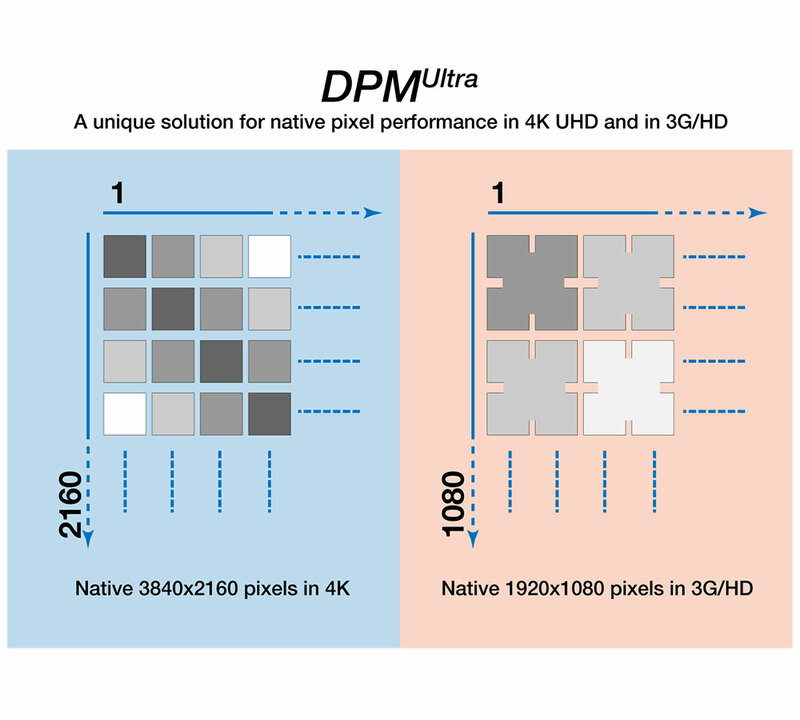 Of course, more pixels = less sensitivity but the LDX86N (native 4K sensor) still is way more sensitive. Do not forget that the LDX has a system were in HD they mix and match the info of 4 pixels to HD. Which in case does make it more light sensitive in HD mode. Yes the Ursa Broadcast has an internal expanding lens to match the sensor size. Which will cost light for sure. The prism in a 3 chipper is also good for about a stop loss so it's same/same at the sensor between the two systems. You'd really have to take a good look at the noise in 4K/2K to figure out the real difference in sensitivity. Anecdotally, I cut a show with LDX 8000 Elites and Micro 4Ks, both at -6db, and it was about 2 stops difference between the two. The matrix out of the Micro 4K is among the most accurate I've seen, it's really close to the Fluo preset on the LDX, I'd extrapolate it would be similar for the UB. The most straightforward approach for matching would be to set the UB to Extended Video, white balance, then match the LDX to the UB. What is the tweak of a knob on the LDX RCP is a roundtrip LUT import export fandango for the UB. You could do the opposite but it would be so much harder at every turn and to what end? None of the presets In the LDX or LDK are awe inspiring. P.S. If you have any luck with the LUT approach please share, I could never get the LUTs to look the same in camera as they do in Resolve, I may have to upgrade to 15 and revisit. Xtreemtec wrote: Do not forget that the LDX has a system were in HD they mix and match the info of 4 pixels to HD. Which in case does make it more light sensitive in HD mode. You are right, but I think you are talking about the LDX86N, when you mean the DPM Ultra Chip. I was talking about LDX86, which only has an Full HD sensor. Anyways I just got informed, that the test camera is going to be a LDX80. So something different, yes. To be fare light sensivity should be compared with the native 4K sensor of the LDX86N so that the amount of pixels is the same. But anyways there still is about 1 stop less sensitivity at the URSA Broadcast. Exact numbers to follow. Howard Roll wrote: The most straightforward approach for matching would be to set the UB to Extended Video, white balance, then match the LDX to the UB. What is the tweak of a knob on the LDX RCP is a roundtrip LUT import export fandango for the UB. You could do the opposite but it would be so much harder at every turn and to what end? None of the presets In the LDX or LDK are awe inspiring. True, but I want to know, if it's possible within the URSA Broadcast . Howard Roll wrote: P.S. If you have any luck with the LUT approach please share, I could never get the LUTs to look the same in camera as they do in Resolve, I may have to upgrade to 15 and revisit. I will try in the middle of November and post results here.